Clint, one of our site visitors asked some good questions about how to hunt moose. What do I use to repel bugs? I suppose I can't use my Vics Vapour Rub Secret? To locate good calling areas do you walk the perimeters of logging cut outs and ponds looking for signs and trails during peak rut? How far away should my camp be from my hunting areas? 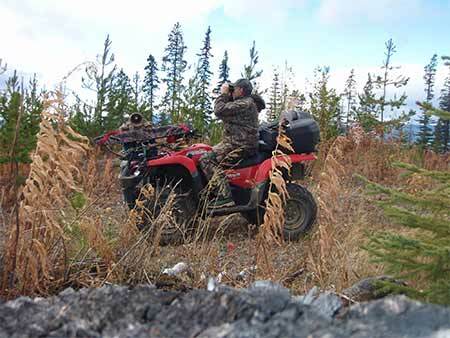 How far do I keep my ATV away from my hunting areas? How long should a person call and wait and what sequence of calls would you use? How long should one hunt a spot till moving on to another spot? If I spot a bull how close do I try and get him to come to me and do I respond with a single low short grunt? If a cow comes in while calling do you leave her there and begin bull grunts or what would be protocol there? I am learning to hunt moose with archery equipment. This is my first with a bow! 1) What do I use to repel bugs? I suppose I can't use my Vics Vapour Rub Secret? Insects can certainly be a problem for the moose hunter; especially once you have the beast on the ground. They can be relentless in their pursuit for your blood. I believe the best insect repellent that has no odor is the ThermaCell Mosquito Repellent. It works great for mosquitoes, although I don't know how well they work for no-see-ums and deer flies. The great thing about this product is it is odorless and portable. During my quest to learn how to hunt moose, another insect repellent I used with great success is the liquid Muskol. Muskol has deet in it, but this is what keeps the bugs at bay. There is some odor, tastes really gross if you get it in your mouth… but hands down this stuff works the best. The higher the deet content, the better. I don't put a lot of effort into being scent-free! Why? Personally, I don't think it is necessary for someone learning how to hunt moose, or for the experienced hunter. Now I know a lot of hunters may disagree with this, that's OK with me; this is my take on it. When I say I am not scent free, I should explain. I use a low odor bar soap for washing, I do not wear any kind of perfume scented materials (IE: after shave, body spray); I would avoid those types of items. I use a relatively low odor deodorant and I usually don't shave while out hunting. I don't own any scent blocker clothing; I don't worry about keeping my hunting clothes separate from the rest of my clothing. I don't use any of those fancy sprays. I do however; use scent free laundry detergent to wash my outer hunting clothes. 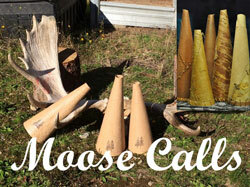 We have learned how to hunt moose this way and we are still very successful in our hunting efforts. We pay attention to the wind and use it to our advantage which is WAY MORE IMPORTANT than being 100% scent-free! There have been times when we've been busted by moose because they got wind of us; maybe the scent free clothing would have helped; I don't know. 2) To locate good calling areas do you walk the perimeters of logging cut outs and ponds looking for signs and trails during peak rut? That would actually be a good way to find out how much fresh moose sign is in an area. Once you find an area where there is lots of good fresh sign and… not much human activity, then this would definitely be a good area to concentrate on. These are important things to look for when you learn how to hunt moose. Cow and calf moose tend to stay near water, food and shelter sources, more so than bulls. But during the rut the bulls know that this is where they'll find the cows and will search out these areas looking for mates. During the rut, lakes, ponds and swamps should not be overlooked as they are prime habitat areas. 3) How far away should my camp be from my hunting areas? When learning how to hunt moose camp location is important. I think you should maintain a distance of… er… ah… 100 meters? 2 kilometers? …more? Seriously though; your camp should not be in any immediate vicinity to where you hunt. 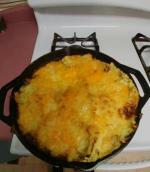 Camp noises, campfire smoke, human voices, cooking odor and human smell will chase any animals away. 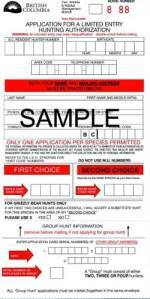 You need to consider your camp location in regards to your hunting grounds... apply this information to the way you learn how to hunt moose. Are you camped in a valley where your sounds and smell will be carried uphill by the warming morning air? Or is your camp at the top of a mountain where prevailing winds blow your sounds and smells out of the country? I've had moose walk right into my camp. I know others that have experienced the same thing? Ideally maintain some distance from where you intend to hunt. The more remote or the lower the human influence on any given area will increase your chances. 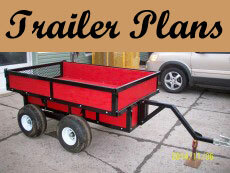 4) How far do I keep my ATV away from my hunting areas? I never ride my quad closer than approximately 1 kilometer. It is again one of those… remove the human noise scenarios. 5) How long should a person call and wait and what sequence of calls would you use? As long as you have patience to wait! During the rut I pretty much stick with the cow in heat call. If I see or hear a bull and he is no longer responsive to my cow calling I'll switch to thrashing and grunting. I'll imitate an aggressive bull and see if he'll come in for a fight! You must be careful though… an angry moose CAN CHARGE! 6) How long should one hunt a spot till moving on to another spot? By spot, I assume you mean an area. If I know a particular area has moose, or fresh moose sign… I just stick to it. I break my hunting areas into known "hot spots", then I just keep revisiting them. Sometimes I'll hit the same spot several days in a row. Eventually he'll show up! Some guys will hunt from the exact same spot for 5, 6 or more days in a row. As I said, as long as you have patience to wait! 7) If I spot a bull how close do I try and get him to come to me and do I respond with a single low short grunt? Last year I shot my bull at an amazing 18 feet! I wanted him close because I was moose hunting with my bow and arrow. 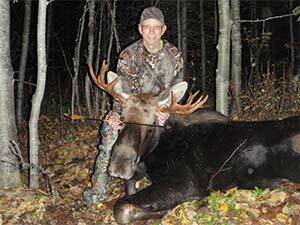 You want your moose to come as close as you feel comfortable to make a shot. 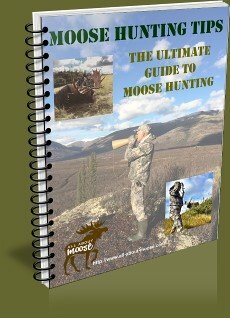 As you learn how to hunt moose you will have a better idea of this. This really has to be a judgment call on your part. Don't risk marginal shots… the last thing you want to do is wound the bull you've worked so hard to get. Take him with a clean vitals shot! Another time I was waiting for the approaching bull to come alongside the bank he was following for a broadside shot; instead he ran up the hill and stopped 20 paces from me… close enough! If the bull you were call calling to was coming to cow calls… don't switch to bull calling unless he won't come any closer. Your bull call may intimidate him and scare him off. Grunting, raking and thrashing all have their place; don't get me wrong. Those are effective tools. The old saying "if it ain't broke, don't fix it" still applies. 8) If a cow comes in while calling do you leave her there and begin bull grunts or what would be protocol there? I would at least at first continue with your cow calling. If a bull is with her he may think it is his cow in heat and come investigating. On the other hand, if your cow is with a bull, he will not leave her for another cow; not until he has bred her. But… if he thinks there is another bull, he may come challenging. Another one of those lessons when learning how to hunt moose. I had a cow and bull combination out in front of me (500 meters or so) a few years ago… he would not leave her, even though I was calling my best cow moose calls. I tried a bull grunt, and he just herded her off into the forest. I switched back to cow calls and about an hour later a bull came out at the same place. I assumed he was the same bull.